The treason trial of Biafran separatist leader Nnamdi Kanu resumed on Tuesday but the defendant again failed to turn up in court. The former London estate agent's populist rhetoric has tapped into lingering separatist sentiment for a breakaway state among the Igbo people who dominate the region. Prosecutor Shuaibu Labaran told the Federal High Court in Abuja that the absence of the head of the Indigenous People of Biafra (IPOB) movement was "frustrating the trial". 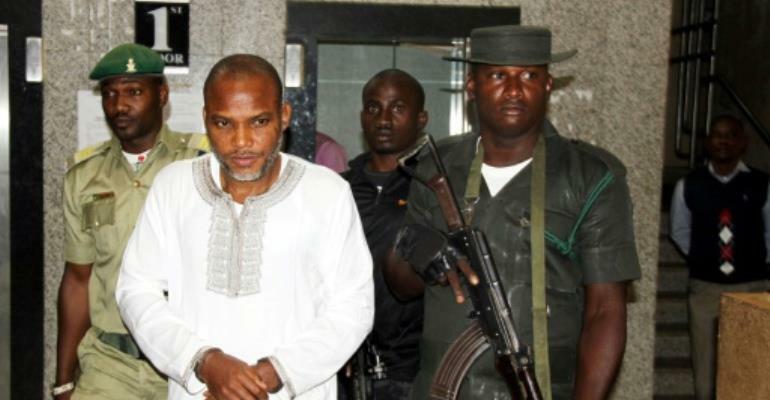 Judge Binta Nyako ordered the trial of Kanu's three co-defendants without him on March 20 and prosecute him separately. Kanu, who also runs Radio Biafra, was first arrested in October 2015, sparking a wave of demonstrations calling for his release across southeast Nigeria. A previous unilateral declaration of independence in 1967 sparked a brutal civil war that lasted 30 months and left at least one million dead from starvation and disease. Most of them were Igbos. Kanu was given bail under strict conditions last year but did not appear for the resumption of his trial in October. He was last seen in September before troops raided his family home in the Abia state capital, Umuahia, during a crackdown on IPOB and its supporters. Kanu's wife, Uchechi, told the BBC in an interview broadcast on Monday: "I don't know where my husband is, whether he is dead or alive, I don't know." She and his family maintain he is being held in government custody. The government denies the claim and a civil court has ruled there is no evidence to support the assertion. Kanu's lawyer, Ifeanyi Ejiofor, said the three people who stood surety for his client were expected in court on March 28 to explain why he did not answer his bail. "(The government) should be in a better position to explain to court where he is," he told reporters outside court. "That is the fact which the sureties are coming to present to the court. "Nnamdi Kanu never jumped bail and at no point has he indicated interest of not coming to face his trial."